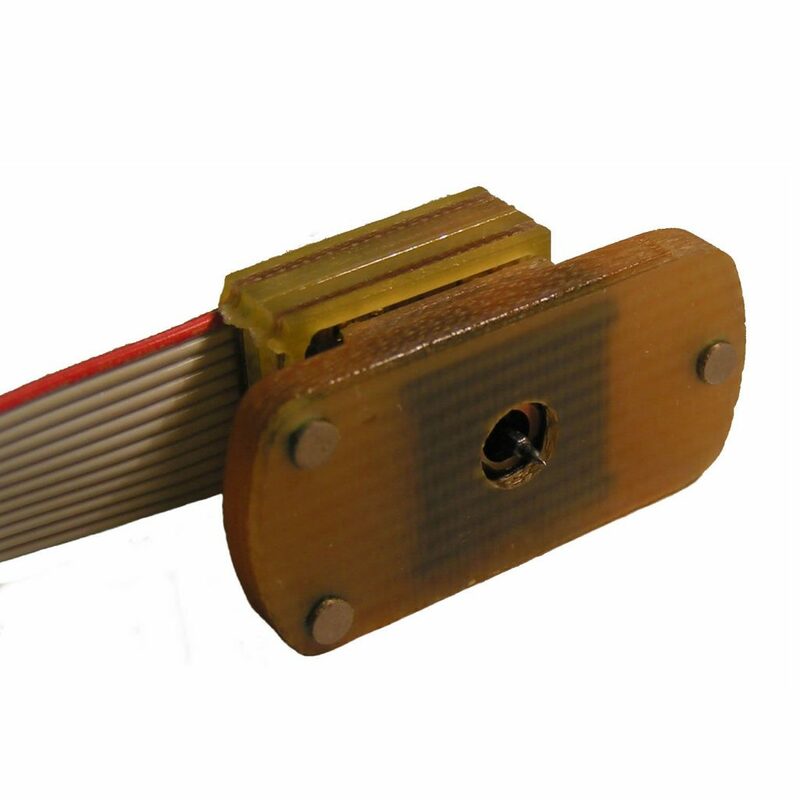 Our capacitive transducer technology is based on a three electrode design, with the outer electrodes mechanically fixed and the center electrode movable. In most cases the center electrode is supported by flexible springs. The output signal is proportional to the displacement of the center electrode, and the maximum output voltage level is roughly equal to the drive voltage level. Strain gauge sensors have an output signal level of roughly 0.2% of the drive signal. This gives the capacitive transducer a tremendous advantage over strain gauge sensors in terms of improved signal to noise ratio, and therefore resolution. A simple capacitive drive circuit is shown to the right. The phase 1 and phase 2 drive signals applied to the two drive plates are square wave electrical signals 180 degrees out of phase with each other. This results in a square wave signal on the pick up plate proportional to the pick up plate displacement. The phase of the signal depends on the direction of displacement, so the demodulated output signal is positive for one direction and negative for the other. The circuit presented above suffers from non-linearity caused by loading of the pickup signal by unavoidable parasitic capacitance Cp. The second circuit eliminates the effects of parasitic capacitance on linearity by adjusting the two drive voltages to keep the pickup voltage at zero. A third circuit variation uses a grounded moving electrode, with fixed drive and pickup electrodes on one side of the moving electrode. This allows for a simpler mechanical structure, but is not used frequently by us as the resolution is not as good, and it requires significant effort to obtain a linear output. More details about drive circuits can be found in our US patent 6,960,945. Without a load stem providing direct mechanical coupling the the pickup plate, the sensor acts as an accelerometer. Full scale range can vary from less than 1g to thousands of g’s. for a full scale range of a few g’s and a bandwidth of 100 Hz, a resolution of about 100 ng (0.1 micro-g) can be obtained. Even higher resolution is possible at lower bandwidth. The size of the sensor is 0.500 x 0.500 x 0.275 inch, and the drive electronics is housed in a case that is 2.50 x 0.91 x 0.32 inch. The electronics could be substantially reduced in size if desired. Even sensors with a full scale range of only +/- 1g can easily withstand shocks of 100’s or even 1000’s of g’s, making them ideal replacements for delicate, heavy and expensive moving coil seismometers for earthquake monitoring and oil exploration. Attaching a stem to the pick up plate through a hole in the outer drive plate and its support structure allows for the application and measurement of an external force to the pickup plate. This makes the sensor function as a load cell or weigh scale, with several orders of magnitude greater resolution than strain gauge units. The image at right is of a transducer used for nanoindentation. 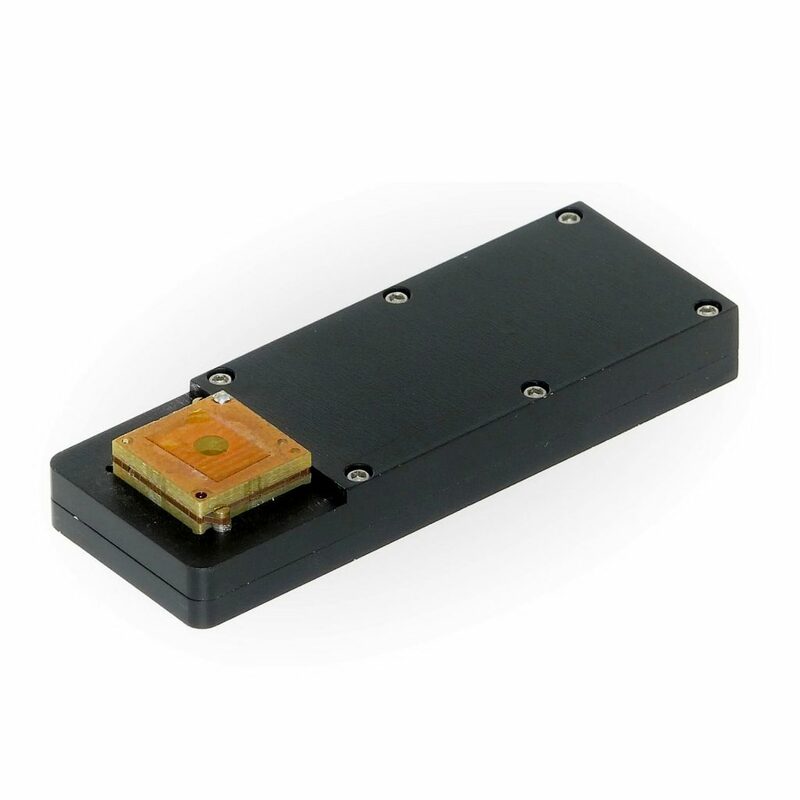 The transducer (rather than sensor since it generates a force internally as well as sensing displacement) uses externally supplied high voltage (up to 600V, at less than 1 mA) to generate a force which is applied to a sample. The maximum force is on the order of 10mN (1 gram). The force resolution is on the order of 10 nN and the displacement resolution is on the order of 0.1 nm. We have no off the shelf products of this type currently available. If you have a need for something shown above, contact us to discuss what we can do for you.